Before I picked up Middlemarch, I always had this vague sense that I didn't like George Eliot, but I cannot for the life of me determine when or where I decided that. I have certainly never read any of her other work. I knew their titles: Middlemarch as the most famous, but shorter works are always at every used bookstore ever. But I heard a long podcast about it (Thanks Melvyn), and was convinced to give it a spin as part of my Only Read Books from before 1900 in 2018 projcect. And dang; it's a TOME - 850 pages in my penguin edition - but SO good. I absolutely get why it's a classic. 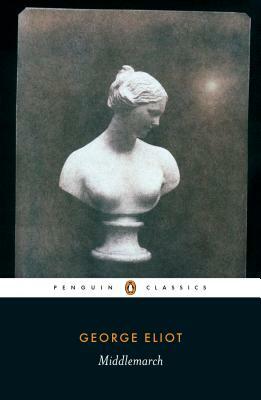 I've been on a Trollope kick before, and moving from genial Trollope to the more acidic (acerbic?) Eliot was a shocker at first: she's just so much more cutting about everybody. But through that, there's really a deep well of empathy for her characters, and I felt affectionate towards everyone in Middlemarch by the end. Except Mr. Brooke. But we insignificant people with our daily words and acts are preparing the lives of many Dorotheas, some of which may present a far sadder sacrifice than that of the Dorothea whose story we know. A man vows, and yet will not cast away the means of breaking his vow. Is it that he distinctly means to break it? Not at all; but the desires which tend to break it are at work in him dimly, and make their way into his imagination, and relax his muscles in the very moments when he is telling himself over again the reasons for his vow. The bias of human nature to be slow in correspondence triumphs even over the present quickening in the general pace of things: what wonder then that in 1832 old Sir Godwin Lydgate was slow to write a letter which was of consequence to others rather than to himself? It was the first time in her life that Rosamond had thought of doing anything in the form of business, but she felt equal to the occasion. That she should be obliged to do what she intensely disliked, was an idea which turned her quiet tenacity into active invention. His native warm-heartedness took a great deal of quenching, and it is a part of manliness for a husband to feel keenly the fact that an inexperienced girl has got into trouble by marrying him. Lydgate could only say, "Poor, poor darling! "—but he secretly wondered over the terrible tenacity of this mild creature. There was gathering within him an amazed sense of his powerlessness over Rosamond. His superior knowledge and mental force, instead of being, as he had imagined, a shrine to consult on all occasions, was simply set aside on every practical question. [Caleb Garth is such a good dude] "Well, perhaps others thought you might have done better. But it would have been worse for me. And that is what touches me close about Fred. The lad is good at bottom, and clever enough to do, if he's put in the right way; and he loves and honors my daughter beyond anything, and she has given him a sort of promise according to what he turns out. I say, that young man's soul is in my hand; and I'll do the best I can for him, so help me God! It's my duty, Susan." "It's no use your puffing Brooke as a reforming landlord, Ladislaw: they only pick the more holes in his coat in the 'Trumpet.'" "No matter; those who read the 'Pioneer' don't read the 'Trumpet,'" said Will, swallowing his tea and walking about. "Do you suppose the public reads with a view to its own conversion?" But let the wise be warned against too great readiness at explanation: it multiplies the sources of mistake, lengthening the sum for reckoners sure to go wrong. There was no denying that Dorothea was as virtuous and lovely a young lady as he could have obtained for a wife; but a young lady turned out to be something more troublesome than he had conceived. In warming himself at French social theories he had brought away no smell of scorching. We may handle even extreme opinions with impunity while our furniture, our dinner-giving, and preference for armorial bearings in our own case, link us indissolubly with the established order. And in the mean while the hours were each leaving their little deposit and gradually forming the final reason for inaction, namely, that action was too late. If Lydgate had been aware of all the pride he excited in that delicate bosom, he might have been just as well pleased as any other man, even the most densely ignorant of humoral pathology or fibrous tissue: he held it one of the prettiest attitudes of the feminine mind to adore a man's pre-eminence without too precise a knowledge of what it consisted in. Nor can I suppose that when Mrs. Casaubon is discovered in a fit of weeping six weeks after her wedding, the situation will be regarded as tragic. Some discouragement, some faintness of heart at the new real future which replaces the imaginary, is not unusual, and we do not expect people to be deeply moved by what is not unusual. That element of tragedy which lies in the very fact of frequency, has not yet wrought itself into the coarse emotion of mankind; and perhaps our frames could hardly bear much of it. If we had a keen vision and feeling of all ordinary human life, it would be like hearing the grass grow and the squirrel's heart beat, and we should die of that roar which lies on the other side of silence. As it is, the quickest of us walk about well wadded with stupidity. The affair of the chaplaincy remained a sore point in his memory as a case in which this petty medium of Middlemarch had been too strong for him. How could a man be satisfied with a decision between such alternatives and under such circumstances? No more than he can be satisfied with his hat, which he has chosen from among such shapes as the resources of the age offer him, wearing it at best with a resignation which is chiefly supported by comparison. He took a wife, as we have seen, to adorn the remaining quadrant of his course, and be a little moon that would cause hardly a calculable perturbation. "She is a good creature—that fine girl—but a little too earnest," he thought. "It is troublesome to talk to such women. They are always wanting reasons, yet they are too ignorant to understand the merits of any question, and usually fall back on their moral sense to settle things after their own taste." Mr. Casaubon's behavior about settlements was highly satisfactory to Mr. Brooke, and the preliminaries of marriage rolled smoothly along, shortening the weeks of courtship. The betrothed bride must see her future home, and dictate any changes that she would like to have made there. A woman dictates before marriage in order that she may have an appetite for submission afterwards. And certainly, the mistakes that we male and female mortals make when we have our own way might fairly raise some wonder that we are so fond of it. We mortals, men and women, devour many a disappointment between breakfast and dinner-time; keep back the tears and look a little pale about the lips, and in answer to inquiries say, "Oh, nothing!" Pride helps us; and pride is not a bad thing when it only urges us to hide our own hurts—not to hurt others.